So it's been a fair while since I've made or posted any crease patterns, and I thought it was about time I did so. 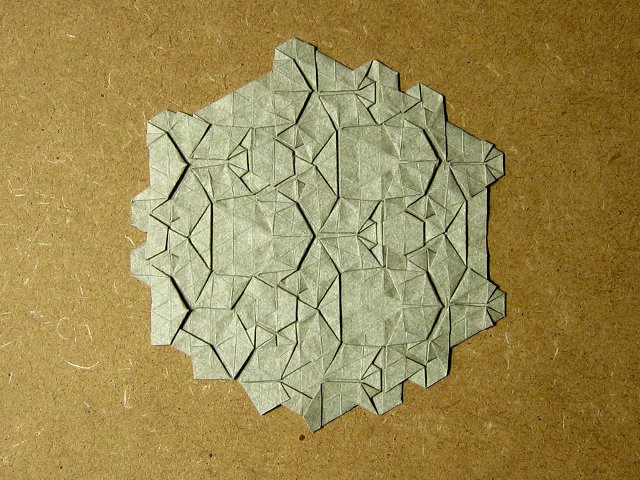 For those of you who enjoy folding tessellations, please give it a try and let me know what you think. It's never actually been folded, so I'm pretty curious to see what it looks like when fully completed. Anyway, the model's quite nice, although I'm still not as comfortable with making rhombic twists as I'd like. I think they're the hardest of the bunch (triange, square, rhombic, hexagon). And you can learn from it at least this: drawing in creases often helps -- and is absolutely acceptable. What i usually do is fold sum of the creases and try to "semi- collapse" it at the same time. Hopefully this will help. Are you by any chance Daniel Kwan? If not, look him up. He's reeeely cool. I recently started making tessellations- I learnt them from you! So right now I find it a little difficult to follow crease patterns.. especially the ones without the guideline grid..
How do I do a rhombic twist?? I have vague plans to make some videos on more tessellation techniques - the rhombic twist would be one of them.